O That's Good! 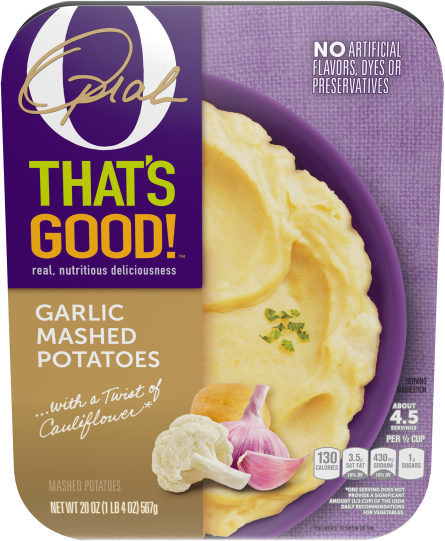 Garlic Mashed Potatoes 20 oz Tray | O, That's Good! 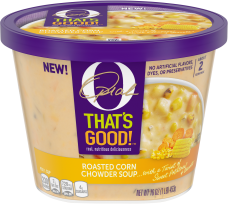 O, That's Good! sides pack a twist that's made to please everyone at your table. 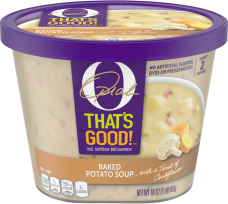 In our mashed potatoes, we've replaced some of the potato with cauliflower, but kept all of the deliciousness. Enjoy the classic comforts you love in a whole new way. 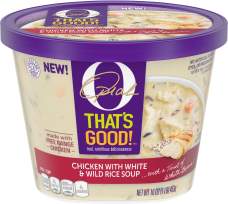 We've replaced some potatoes with mashed cauliflower, so you get a varity of veggies in every bite of rich, creamy goodness. POTATOES, CAULIFLOWER, MILK, CREAM, SKIM MILK, CONTAINS LESS THAN 2% OF SALT, CULTURED DEXTROSE, CULTURED SKIM MILK, DRIED GARLIC, DEHYDRATED BUTTERMILK, SPICES, CITRIC ACID, AUTOLYZED YEAST EXTRACT, GELATIN, CULTURES, NATURAL FLAVOR, ONION POWDER, NISIN PREPARATION (TO PROTECT QUALITY), BUTTER EXTRACTIVES. 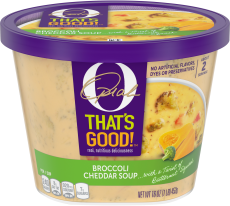 O, That’s Good! 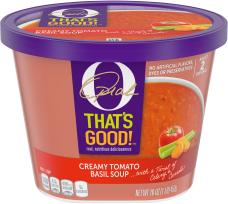 soups are made with a twist you’ll love. 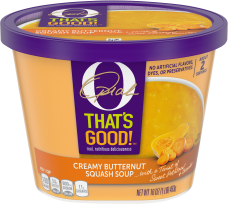 We’ve replaced a few of the indulgent ingredients, like some of the cream with butternut squash and cauliflower, without sacrificing the delicious taste you crave. Rediscover your favorite recipes thanks to a whole new, veggie TWIST.